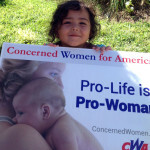 Concerned Women for America (CWA) members around the country joined the thousands protesting at Planned Parenthood clinics today. The nationwide protests (several bringing thousands to one location) called for an end to the tax-payer funding of Planned Parenthood, the nation’s largest abortion provider. The defunding of Planned Parenthood is a no-brainer now that the undercover videos from the Center for Medical Progress have shown the callous andvery likely illegal way Planned Parenthood uses women and their unborn, aborted babies for profit. My family and I attended the protest in Annapolis, Maryland, and there were more than 200 protesters! It didn’t make for great pictures because the clinic was on a busy street with narrow sidewalks so that we had to be spread out. But the enthusiasm was palpable. We sang hymns and prayed together. It was a great image of the pro-life movement: families standing together in the name of justice and truth! I got the chance to pray and asked our Lord for a day when all women in crisis pregnancies are loved and supported, so that abortion is not even considered. I prayed for men to be men and stand to take responsibility for the life they have brought into the world. I prayed for an end to this industry, for a thwarting of the enemy’s stronghold on our country through this horrible, unnecessary practice. 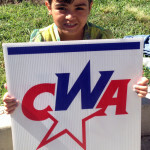 CWA is committed to this fight. Join us! Together we are stronger!